Train + underground: RENFE Local Train Network (Red de cercanías Barcelona de RENFE) Get at the stop CLOT (Barcelona). From there, change to the underground network line 2 (purple) in direction Badalona Pompeu Fabra, get off at the stop Artigues/Sant Adrià 74 m (about 250ft) from the Hostel. Taxi or private transport: follow the indications to Ronda Litoral – direction Port (Harbour), leave the Ronda by exit Sant Adrià (n. 26). From there follow street directions to Hostal Athenas. If you are travelling by metro take line 2 (the purple line) in the direction of Badalona/ Pompeu Fabra, get off at the stop Artigues/Sant Adrià, leave the station by the exit AV JOAN XXIII, walk straight about 40 m by this avenue and turn right in the first crossing by Andreu Soler street. The Hostel is located right at the corner of this street with Carrer Bogatell. 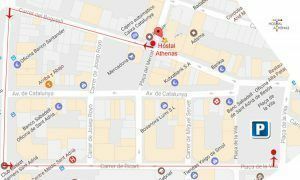 You may walk up the Carrer de la Platja (avenue in front of the station, walking under tjhe motorway bridge, follow onto Avinguda Catalunya and turn right when you reach the Sant Adrià de Besòs Market , The Hostel is right at the corner of Andreu Soler street with Bogatell street in front of the Market. You may also catch the bus number 6 or 26 at Carrer de la Platja and get off after you cross under the motorway bridge. Turn left into this avenue when you reach the crossing with carrer (street) Andreu Soler. The Hostel is located right at the corner of this street with carrer Bogatell.